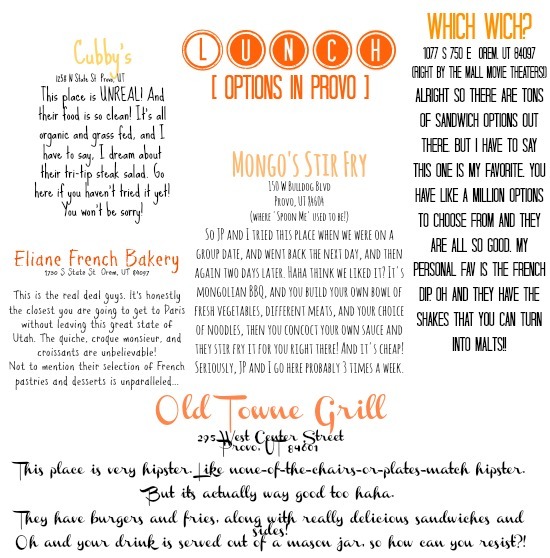 Life in Technicolor: Provo Food Crawl: Lunch Anyone? Thank you for sharing. My aunt teaches at BYU and we are coming over from Australia at Christmas to visit. We love trying out new food places when we come over. We will be trying out these ones. My family came down from Salt Lake to visit me in Provo and we went to Eliane French Bakery on your recommendation and OH. MY. GOSH. I can't stop thinking about how good it was! I was in heaven! We had one of almost everything and shared it between all of us, and everything was to die for. Thanks for the tip! I'll definitely be visiting the bakery again soon! cubby's is one of my favorite restaurants of all time. i wish i lived in provo so i could decrease the distance between the two of us. i pray they expand into salt lake.